This is the story of this record. Exactly how it happened. . .more or less. One day a producer who worked for P.Diddy’s “Hitmen” production team picked up this 45 at a local record shop. They made a beat out of the horn riff and Jay Z ended up hearing that beat. He liked it and used it for his single “Roc Boys.” The horn line became the summer hood anthem. My friend was hood famous, which these days is the best kind of famous. The Jay Z track was no doubt played countless times at the parties held at Se Hace el Camino al Andar, but they didn’t know that the weird white boys who played the noisy music on the second floor were responsible for the original track. They also didn’t know that the original track was named after their organization. They did think Jay Z’s flow over those fresh horns was tight. And that’s the story of this record. It’s made by my friend who’s a good guy, has a great ear, and can put fresh horns on anything. Even Jay Z lyrics. And if you think this is good then you should get a hold of their album right now. 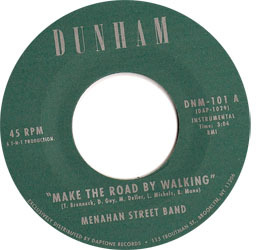 *Check out the Menahann Street Band’s debut album here. And support live music by going to their show this Friday here. This entry was posted on Wednesday, October 15th, 2008 at 1:32 am	and is filed under Uncategorized. You can follow any responses to this entry through the RSS 2.0 feed. You can leave a response, or trackback from your own site. thanks for the info! one of the best tracks. great blog btw.